Council Purpose: Discuss issues facing the remodling industry today and informative programs with guest speakers. All members welcome for complimentary lunch and meeting. 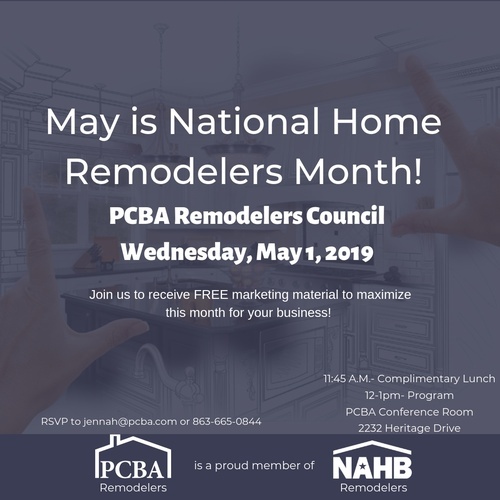 May Meeting Topic: In addition to regular business, we will be discussing ways to use the month of May, National Home Remodelers Month, to get the word about the difference between an unlicensed handyman and a licensed professional remodeler. *All May meeting attendees will receive a free paper and electronic copy of the "NAHB National Remodelers Month Marketing Toolkit".